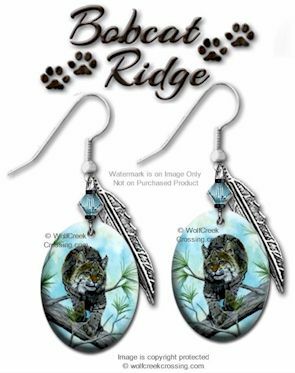 These lovely porcelain art Bobcat Ridge Earrings are beautifully detailed and kiln-fired for a permanent beauty that will last a lifetime. The porcelain art earring charms measure approximately ¾” x 1″, and hang from hypoallergenic surgical steel hooks. The approximate overall length of the earrings from top to bottom is 2¼”. These lovely earrings make a unique gift for any occasion. ALL of our products come to you in NEW, UNUSED CONDITION. We will package your purchase with SPECIAL care and send to you via USPS First Class mail. 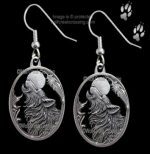 Our wildlife art jewelry is proudly MADE IN THE USA. 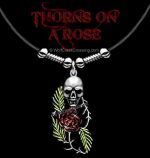 Check our Site for Matching Accessories. We offer many styles of necklaces, earrings, ankle bracelets and hat bands that pair wonderfully with our other Western Art pieces.